Fennimore senior Logan O'Brien will play offensive line at the University of Wisconsin next fall. POSTED December 27, 2018 11:40 a.m.
FENNIMORE — Logan O’Brien will have the opportunity to live out a childhood dream next fall. The Fennimore senior signed a National Letter of Intent last Tuesday to become a preferred walk-on offensive lineman for the Wisconsin Badgers next fall. O’Brien, who is 6-foot-5, 245 pounds, started at left tackle and defensive line this past fall and helped lead the Eagles to a 10–2 mark, a second-place finish in the Southwest Wisconsin Activities League and a berth in the third round of the WIAA Division 6 playoffs. O’Brien was named the SWAL Lineman of the Year and earned first-team All-SWAL honors on the offensive line as the anchor of the unit that helped the Fennimore offense average 35.4 points and 343.8 yards per game, including 146.3 rushing yards per game. He was also a first-team All-SWAL selection as a junior when he helped Fennimore post an 8–3 record. O’Brien went from a 200-pound sophomore, to 218 as a junior, to 245 this past season. The Badgers began recruiting O’Brien in early October when they invited him for a game visiting on Oct. 3 when Wisconsin hosted Nebraska. O’Brien initially sparked the Badgers interest at a Wisconsin Football Coaches Association combine last summer in Sussex. After the game O’Brien and the other game day recruits were invited into the locker room to meet coaches and players. Coach Chris Haering, the UW special teams coach and in-state recruiting coordinator met with O’Brien. Four weeks later O’Brien was invited to another home game against Rutgers on Nov. 3. A few days later he was texting with Wisconsin offensive line coach Joe Rudolph. A few days later, O’Brien was accepted into the university and text back to let Rudolph know he would be attended UW in the fall. “At that point it didn’t seem like I was accepting the verbal because it felt so unofficial, but I went to the next game against Minnesota and all the coaches were congratulating me for being on the team,” said O’Brien. 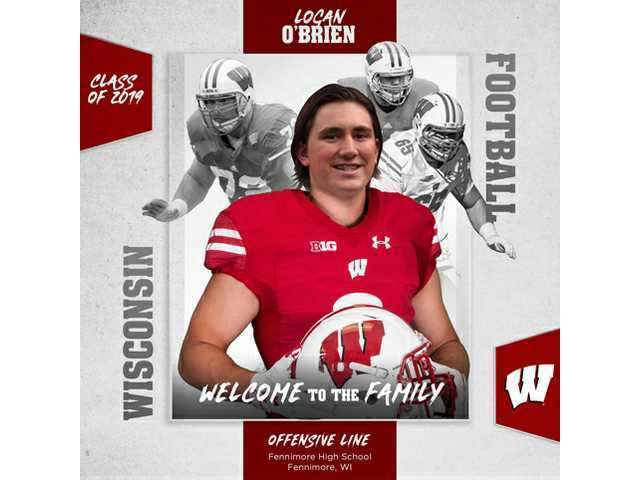 Coach Hearing came down to visit O’Brien at Fennimore High School in early December and said Wisconsin would be sending the official walk-on paper work to be signed on Dec. 17. O’Brien had scholarship offers from a handful of Division 2 schools, but chose UW to pursue a childhood dream. “Logan did not receive any other D1 offers, but I think that is because he had his heart set on UW,” said Roth. “I am confident that several offers would have came his way had he wanted to leave the state. There were Division 2 offers made, but once again UW was his dream. Wisconsin had a strong recent tradition of walk-ons, especially from Southwest Wisconsin. Fennimore’s Luke Swann was a walk-on wide receiver for the Badgers in 2003 and went on to become a scholarship player, a three-year letterwinner and Wisconsin team captain as a senior captain in 2007, when he caught 25 passes for 451 yards and 2 TDs before suffering a season-ending hamstring injury. He also signed as an undrafted free agent with the Kansas City Chiefs in 2008. Lancaster defensive backs Zach Hampton (2002–06) and Adam Hampton (2007–11) both walked on and eventually earned scholarships a special teams players. The younger Hampton played in back-to-back Rose Bowls in 2010 and 2011 on special teams. Richland Center’s Bradie Ewing began his Wisconsin career as a walk-on in 2007 and became a two-year scholarship player and a team-captain as a senior in 2011 as the team’s starting fullback. He also played in back-to-back Rose Bowls and was drafted by the Atlanta Falcons in the fifth round of the 2012 NFL draft. Most recently, Darlington’s Alex Erickson (2011–15) went from walk-on wide receiver to scholarship player to NFL player with the Cincinnati Bengals. He finished his UW career with 141 receptions (sixth all-time) and 1,877 yards (10th all-time). He finished his senior season with 77 catches for 978 yards and three TDs and earned first-team All-Big 10 (media) honors). Erickson was signed as a free agent with the Cincinnati Bengals in 2016 and is in his third year on the roster. O’Brien is the son of Racheal Loy and Justin O’Brien.